This unusual post card was up for sale recently on ebay and I was intrigued to see that it was published by the Alpha Trading Company of St Albans - so I purchased it with the intention of finding out what the picture represented - and what the connection was with St Albans. Cooper and Stanley Collier, called 'Skats' by his boss, were close friends. 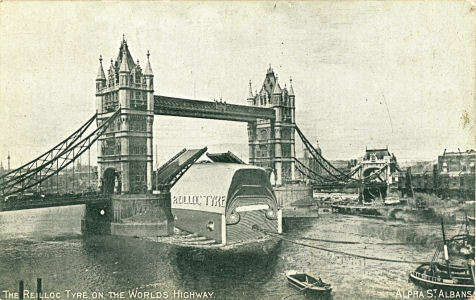 The Alpha Trading Company issued two different picture postcards of the Reilloc Tyres, the anti-puncture tyre invented by Stan's father. The Herts Advertiser & St Albans Times mentions this new invention as being shown by the Cinematograph, and both Audrey and her husband Jan, on different locations suggest that it could have been partly animated. The illustrations of the two picture postcards could have been used in the moving picture. We are not at all sure if there were interpolated scenes, and if they were animated or made with trick camera work. The only thing we are sure of is that Cooper, assisted by Stan Collier, made an advertising picture for a tyre invented by Collier Senior. Arthur was born in Deptford, Greenwich, on 6th October 1854, the son of Augustus Collier (an accountant) and Mary Ann Larenson Page Collier. 1871 At the time of the census he was a chemist's apprentice living with his brother in St John Street, Newport Pagnal, Bucks. 1881 The census shows that Arthur T Collier (born Deptford) was a "Student of Theology" in Compton Gifford, Plympton St Mary, Devon. 1886 Son Arthur Stanley Collier born in Cornwall. 1891 The census shows him to be a telegraph engineer living at Bondi, Croydon Road, Caterham, Surrey. Listed as the Rev Arthur T. Collier, living at Gonvena, Beaconsfield Road, St Albans. It should be noted that the minister listed at the Congregational Church was Rev. William Carson. Cordingley's Autocar and Motor Cycle Show at the Agricultural Hall, Islington held 3rd - 10th July 1899. Collier, 15, Walbrook, E.C. This Exhibitor introduces a new tyre, termed the "Twin" motor tyre, in which we have the old idea of a solid tyre carried on the top of a pneumatic. The canvas sides holding the air chamber of the pneumatic section are drawn together in the rim by a system of a single wire, the opposing ends being crossed, and drawn tight when required. We do not think there is much in this for motor cars. Exhibitors at the 1903 Motor Show held at Crystal Palace on the 30th January to the 7th of February. Collier Twin Tyre Co. The exhibit will include three of the car tyres which ran the whole of the 4,000 miles in the club tyre trials last September. Two of the tyres were untouched throughout, the third required occasional pumping owing to a faulty valve, and the fourth ran half the distance, when it was punctured by a large nail. Another tube was put in, and completed the trials untouched. Some of the tyres will be fitted with Parsons's Skidnot chains. Both His Majesty the King and H.R.H. the Prince of Wales have decided to have Collier Tyres fitted to their new Daimler cars. The Collier Twin Tyre Company (Old Company in Liquidation) to be wound up. 1 July, 1904. 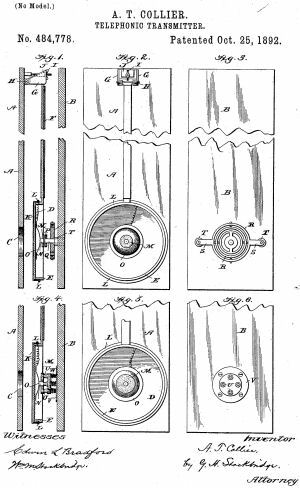 Details of various UK tyre patents to Arthur Thomas Collier and Reilloc Tyre Co. 1905-1909. THE REILLOC TYRE CO., LTD., 122, Victoria Street, London, show specimens of their patent tyre, and also sections of same showing clearly the form of both tyre and rim, as well as the means employed to attach it. The makers claim that its design enables every ounce of the rubber to be utilised in cushioning the wheel as all is practically above the flanges. A feature of the tyre is the use of flexible canvas so placed as to be free to accommodate itself to any movements of. the rubber. The method of attachment is by a wire running through flaps, which are provided on the tyre on each side, and end in right and left hand threads engaging in a strong barrel nut. This firm also show some of their Reilloc pneumatic tyres. The Collier Tyre Company are exhibiting a tyre which has run 17,065 miles. 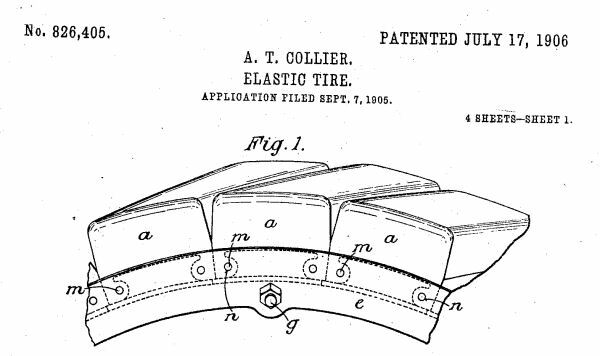 For the 1906 season the Collier tyre-makers are showing beaded-edge tyres, in addition to those attached by the usual Collier patent fastening. The Collier Tyre Company, Ltd., of Long Acre, W., showed the now well-known Stepney wheel. This comprises, as our readers are aware, a complete rim in tyre and tube, which can be bolted alongside the usual wheel when the tyre of the latter is punctured or otherwise injured. It is now arranged with a more adaptable fastening, by means of which it can be attached to any type of artillery or other wheel. Among the numerous essential accessories, tyres take the first place. Those manufactured by the Collier Tyre Company are well known for their good qualities, and will be found, as last year, in the gallery on Stand No. 260. Among their features for next season is the new non-skid type, fitted with all-rubber, non-skidding tread. There are no metal studs, so it is practically dustless. Rubber blocks are used instead, which have already proved very satisfactory. The firm wish it mentioned that they have reduced the price of their tyres considerably from the present date. They also make an advantageous offer to motorists, particulars of which can be had at the stand. Before Mr. Justice Coleridge. - For judgement: The Reilloc Tyre Co. Ltd. and another v. Société Francaise des Pneumatiques Dunlop Ltd. The Collier Tyre Co., 127-130, Long Acre, London, in addition to showing a range of their tyres, have a speciality in a detachable rim. It is held on the wheel by a series of locking blocks or wedges, giving perfect security against the rim moving. This rim has been given a 3,000-mile test on a landaulet weighing nearly two tons. The Census describes him as Patentee of electrical and mechanical devices, living at The Shrubs London Road St Albans. US Patent August 10, 1915. Arthur Thomas Collier is listed at 43 Victoria Street, St Albans, and Miss E. M. Collier had a school for boys and girls at the same address.